Welcome to the Math Salamanders Kindergarten Counting Games. Here you will find a wide range of free printable Math Games to help your child learn to count on and back, and also to help them learn their Math facts at kindergarten level. At a Kindergarten age, children love to play and explore Math with fun Math activities and games. 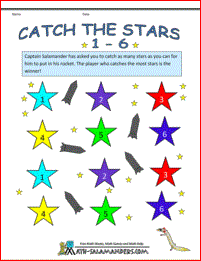 Children will enjoy completing these Math games and worksheets whilst learning at the same time. During Kindergarten, children have already started to develop their understanding of numbers and place value. By the end of Kindergarten, most children should be able to count, read and write up to the number 25, and compare numbers up to 10. They are also starting to learn the names of some of the basic shapes, comparing the length and weight of different objects and learning to sort and classify them. The free printable Kindergarten Math Games, and other Math activies will help your child to achieve their Elementary Math benchmark set out by Achieve, Inc. In the UK, Kindergarten is equivalent to Year 1. 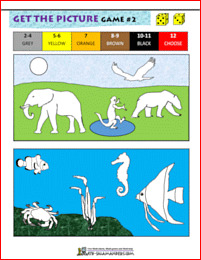 Have fun using these free Kindergarten Counting Games...we hope you enjoy them! For this game you will need one die, and some counters. Get the Picture Game #1 is a simple matching game where you have to match the number of spots on a dice to a number from 1 to 6. The aim of the game is to be the first person to complete your picture by collecting all the animals and objects that go with it. For this game you will need one dice and some counters. Get the Picture Game #2 is a similar but slightly trickier version of Game #1. The numbers on two dice are added up, and the total has to be matched to a grouped interval on the board. The aim of the game is to be the first person to complete your picture by collecting all the animals and objects that go with it. For this game you will need two dice and some counters. Learning skills: adding the roll on 2 dice together; matching the number on the die with a grouped interval on the board. 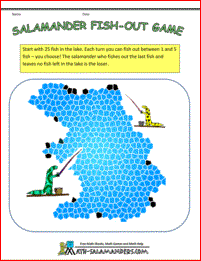 Salamander Fish Out is a simple environmental game which involves removing a certain number of 'fish' from the lake on each turn. The aim of the game is to avoid being the player who fishes out the last fish (so destroying the future fish stock for the lake). Although this game is suitable from the age of kindergarten, it is very good at developing strategic thinking skills in older children. Learning: Counting to 5, strategic thinking. 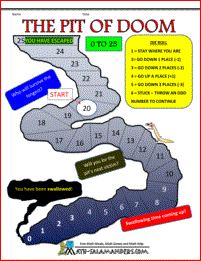 The Pit of Doom is a counting game for helping children familiarize themselves with numbers from 0 to 25. The game should also help them understand about counting on and especially counting back. Learning: numbers to 25, counting on and back. 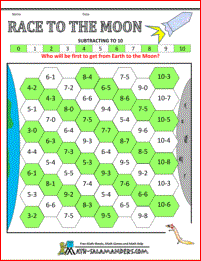 Race to the Moon is a Math game which develops addition and subtraction of numbers up to a total of 10. 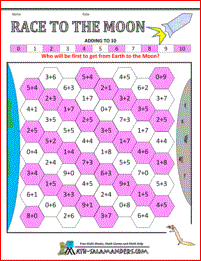 The aim of the game is to complete an unbroken path of counters from the Earth to the Moon by working out the sums. Learning skills: - adding numbers to 10; strategy. Learning skills: - subtracting numbers to 10; strategy. Learning skills: - adding and subtracting numbers to 10; strategy. Trap the Spiders is a kindergarten counting game which involves trying to catch as many spiders as you can. The aim of the game is to be the player who catches the most spiders. You will need a dice to play this game. Learning skills: counting the number of spots on a dice, counting the number of spiders trapped. 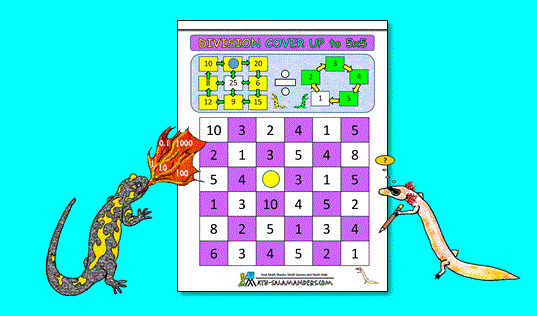 Race to 100 is a snakes-and-ladders type game where you have to move along the board from 1 to 100. There are lots of special squares which may mean you get a penalty or a bonus depending on the color you land on. Learning skills: Counting up to 100, counting on and back up to 5 squares, learning how to use a 100 square. Looking for some harder games? If you are looking for some more challenging math games for kids, then why not try our selection of free math games for first graders? Here you will find our range of free printable Kindergarten Counting Worksheets. The following worksheets involve using the basic skill of counting with numbers up to 25.
match numbers of objects with their values. 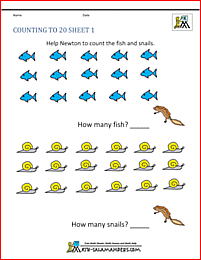 All the free Math Worksheets in this section are informed by the Elementary Math Benchmarks for Kindergarten.